Oscar-nominated actor Jude Law plays a pious aristocrat in director Joe Wright's sumptuous big screen adaptation of Anna Karenina. Almost unrecognizable behind a steely exterior, Law's Karenin is Anna's spurned husband in the film, which begins its roll out Friday and is a possible awards season heavyweight. Law seamlessly pulls off playing the high-ranking nobleman whose position at the heights of Imperial Russian society is rocked when his wife embarks on an affair with a dashing young soldier. Speaking about his role, Law, who turns 40 next month, said that he doesn't think he could have played the character when he was younger — but he certainly would have given it a go. Joe Wright's latest Anna Karenina had a cast, screenplay and plan of action in hand in the spring of 2011, but the acclaimed filmmaker of Atonement and Pride & Prejudice made a bold step a mere two months before beginning the shoot. Instead of another straightforward narrative telling of the story of the epic novel by Russian great Leo Tolstoy, he opted to go for a theatrical angle in depicting the saga of a late-19th century Russian high-society aristocrat who breaks entrenched taboos and embarks in a torrid love affair with affluent soldier, Count Vronsky. In Toronto where the film is having its World Premiere Friday night, cast members including star Keira Knightley and Wright likened the sudden change to "jumping off a cliff," but they were ready for the challenge, though not all were sure if it would ultimately succeed. Fittingly lavish, new images from Anna Karenina, the splendor of imperial Russia is merely the backdrop for a scandalous love affair. But strict rules and mores adhered to (and then broken) by high society have long been enticing setting for 99 per centers (and their friends) throughout the ages to witness aristocratic crash and burns through fleshly indulgences. And the screen version of Leo Tolstoy's novel appears to not hold back. First things first: Rise of the Guardians is an animated adventure, but it's not a sequel to that owl movie. I know, it's very confusing. What's more, it's about Santa Claus — a brawny, tatted-up Santa who pulls a Sam Jackson and assembles a superteam to fight evil and protect the children of the world. The other fantasy heroes called to duty? The Tooth Fairy, the Easter Bunny, and the Sandman. It's pretty much The Avengers for kids, only I'm willing to bet it'll have a better soundtrack. Hey-oh! Romance! Jealousy! Temptation! There's an alluring new stranger vying for Sherlock Holmes's attentions and affections in Guy Ritchie's turn-of-the-century sleuthing sequel, A Game of Shadows, but it's not the dark and beautiful gypsy woman at the center of Holmes's latest mystery. For that matter, Holmes's on-again, off-again ladyfriend Irene Adler doesn't truly have his heart, either. It's BFF and hetero life partner Dr. Watson who forms the tale's real love triangle with Holmes -- escalating the first film's bromantic undercurrent of mutual admiration and "circumstantial homosexuality" to overt, unabashed man-love and dangerous attraction -- with tantalizingly evil interloper Professor James Moriarty. The stakes are higher and the villains far more treacherous (Moriarty! ), but everything in Sherlock Holmes 2: A Game of Shadows is of a piece with the 2009 predecessor that introduced Robert Downey Jr.'s turn as the titular OCD turn of the century sleuth. 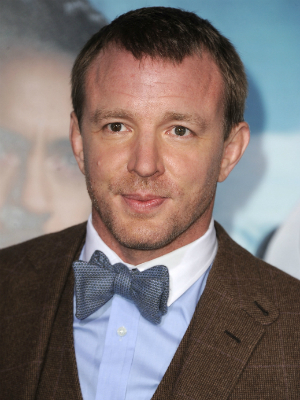 For director Guy Ritchie it's felt like one long evolution from the days of Lock, Stock, and Two Smoking Barrels; now, at the helm of his biggest film to date -- which features some of the most innovative action sequences of the season -- Ritchie is firmly in his wheelhouse. As he told Movieline recently in Los Angeles, "I enjoy playing in a bigger sandbox... and I enjoy having powerful friends to help me manifest a vision." If the recipe for a good holiday blockbuster is three parts violence, one part witty banter and one part cross-dressing, then the new Sherlock Holmes: A Game of Shadows trailer guarantees that this December's Robert Downey, Jr. sequel will be the best blockbuster all season. Paint on your heaviest blue eyeshadow, drag your quippy sidekick away from his newspaper and click through for the trailer. "Don't talk to anyone, don't touch anyone. Stay away from other people!" If the first trailer for Steven Soderbergh's Contagion is a little paranoid-inducing, maybe that's for the best. Once the birds start weaponizing avian flu for use on us humans, it's only a matter of time before the streets empty themselves of humanity. Jude Law's bubble boy suit isn't looking so silly now! Sherlock Holmes -- Guy Ritchie's 2009 blockbuster take on Sir Arthur Conan Doyle's famous 19th century investigator -- struck such a chord with its witty bromantic banter and sense for high period adventure, why not repeat the formula for the sequel? After the jump, watch the first trailer for Sherlock Holmes: A Game of Shadows, featuring everything you loved about the first film, now with a new villain, a girl with a dragon tattoo, and Robert Downey Jr. in drag!